This, just in, from Derek Blackadder at LabourStart. While it is addressed to trade unionists it should resonate with anyone who believes in democracy. The Conservative government’s decision to impose back-to-work legislation strikes at the heart of democracy; it is a form of forced labour, something expressly forbidden by the International Labour Organization of which Canada is a member. If you think the Tories will stop with postal workers, think again. We must stop Harper here. Please support the LabourStart campaign and tell Lisa Rait and Stephen Harper what they can do with their back-to-work legislation. As trade unionists we understand that the right to free collective bargaining without interference from the state is fundamental to what we do. When the state interferes on behalf of an employer our rights as workers are at stake. ‘Our’ newly-elected Conservative majority government is using the Post Office lockout as the first salvo in its war on trade unions in this country. The legislation not only forces an end to free collective bargaining, it imposes wages that are less than those Canada Post had tabled. Our CUPW e-campaign is within sight of the 10,000 messages mark. The Minister of Labour is saying that she has thousands of messages demanding legislation to end the strike and to impose new conditions of employment on post office workers. Help give the union the ability to say ‘we have tens of thousands of messages demanding free collective bargaining’. Help build not only CUPW’s fightback, but the 4 year long fightback that has just started. Join this campaign here and pass this link along to ALL your contacts! Paul, it’s probably going to take a showdown to shift Harper’s anti-labour attitude. By that I mean a general strike. Canadians can protest until their lungs burst but that won’t change Harper’s outlook. The Harper Government takes hundreds of millions of dollars from the profits of Canada Post every year. Now the Harper Government has created a lockout/back-to-work senario so that they can force rollbacks upon the common worker and so that they can continue to reap huge profits from Canada Post. Just think of how unfair this is. What the Harper Government is doing is a “conflict of interest”. They say the back-to-work legislation is for the interest of the Canadian economy, but they also have a second interest in the profits of the company. These two interests are in conflict with eachother. It appears to me that true reason the Harper Government is pushing for back-to-work legislation is supress the employee to put more money in their own pockets. In a just court of law the Harper Government can be sued for “conflict of interest”. Unforntunately, at this point it is stupid to fight the back-to-work legislation. If Canada Post employees remained locked out for two more months their incomes would suffer greatly and there might not be much of a Canada Post to come back to. The best thing for CUPW to do at this point is to allow back-to-work legislation to pass and then file a law suit against the Harper Government for “conflict of interest”. 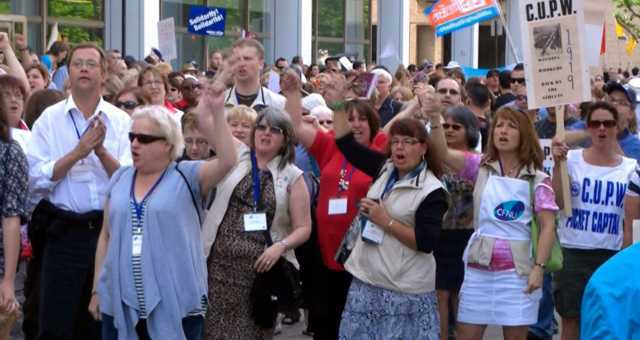 Force the Harper Government to relinquish all interest they have in the profits of Canada Post and repay all past profits to be divided amoung the workers. That would teach those crooks.